Hi! 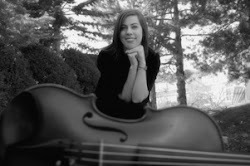 I'm Megan, a violin teacher in Utah. 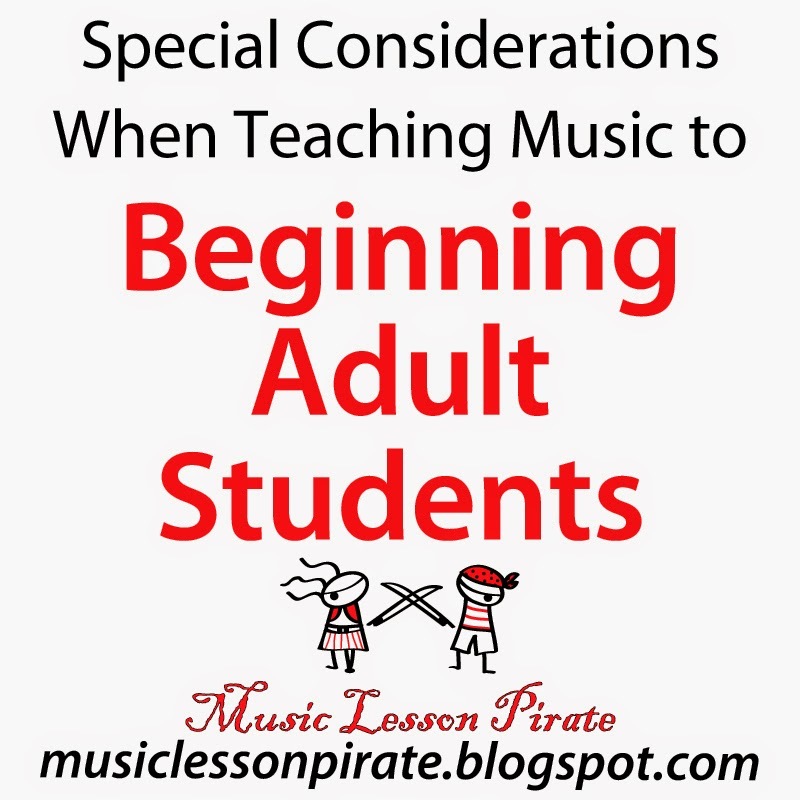 Welcome to Music Lesson Pirate, a blog for sharing music teaching resources & ideas. It's been said that the best teachers are thieves; of course we shouldn't actually steal from people, but all can benefit from willingly sharing ideas & collaborating often with other teachers. So let's share! Click around to get acquainted & please contact me with ideas or questions. Setting pricing is something important to running any business. But where do we start, as music teachers? My opinion is that there needs to be a balance between charging a rate that is low enough to be fair and reasonable, that students are willing to pay, and also charging a fee that is high enough that it reflects our experience and expertise, so students value what they are getting, and that sets you apart from other less-experienced teachers. You also want to be covering your own costs, plus making a profit. 1. Consider the market where you live. Supply and demand. What people are willing to pay will differ by location, and will be impacted by how saturated the area is with teachers of your instrument, and how high the demand for teachers is. If you are new to an area, or are just getting started, you can start by doing a little "market research". Go ahead and contact a few teachers, tell them who you are and that you're trying to get a feel for the going rates in the area, and straight up ask them how much they charge. In my experience, I've haven't found a teacher who wasn't willing to help by giving me this helpful information. Use this as a starting place to get familiar with the going rate, and what people are willing to pay in your area. I don't recommend significantly underselling other teachers, because this can lower your own credibility (from a student's perspective: "Hmm, I wonder why this teacher charges so much less? She must be less experienced. Maybe she doesn't know what she's doing?"). It also makes it harder to raise your rates later to the market rate. 2. Consider your teaching experience and educational background. As you are looking at the pricing of other teachers in your area, look to those with similar education and experience as you. This can help you set your prices in an appropriate range. 3. Consider your own costs. This varies widely from studio to studio. Having a projected budget makes it easier to get an idea of what you need to make in order to be successful. I'll cover this more in a future post, but it will also guide your goals and business decisions as well. Do you rent a studio space? What are your expenses, or projected expenses? What is your biggest expense, or projected expense, for your music studio? 4. Consider what other student fees your tuition fee will cover. What exactly is included in what the students pay for tuition? Is it tuition only? Recital hall rental fees, membership dues, materials fees, etc.? Some teachers choose to have a separate materials fee or recital fee. If you include these all in tuition, take that into account as you set your price (and let your students know it's included, so they recognize the value they're getting!). What other expenses will you need to cover, while still making a profit for yourself? 5. 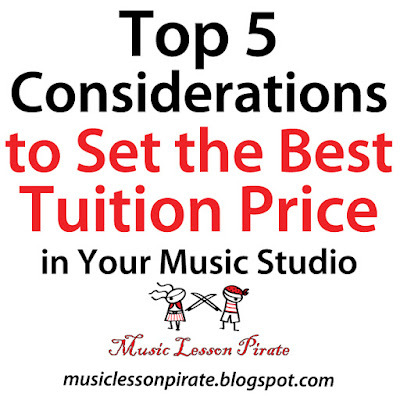 Consider whether you will charge by individual lesson, monthly fee, or a semester fee. This decision is a very individual one, and I think any choice can work for a number of reasons. Ultimately, it's up to you as the teacher to decide what works for you. When setting your pricing, you'll need to take your "billing cycle" into consideration. If you are charging per individual lesson, there may be months when you make more, for example if there are five weeks in the month, and some months when you make less, such as when holidays occur. Decide if you are okay with this. Overall, it should more or less even out, you'll just need to be aware if it's a month where you'll make less and plan accordingly. If you are charging a monthly fee regardless of how many lessons there are, you may have some months with fewer lessons due to holidays, and some months with more, but you'll be making the same amount each month and it's predictable. This predictability can be nice, and the regular amount can be easier on your students to remember. Another option is to charge per semester, and give an option to pay all up front (some offer a discount for this), or to split it up over several months. One advantage to charging by semester is that once students have paid up front, you don't have to worry about billing for the course of the semester. Also, it's nice to know they've paid in advance and have committed to those months of lessons. 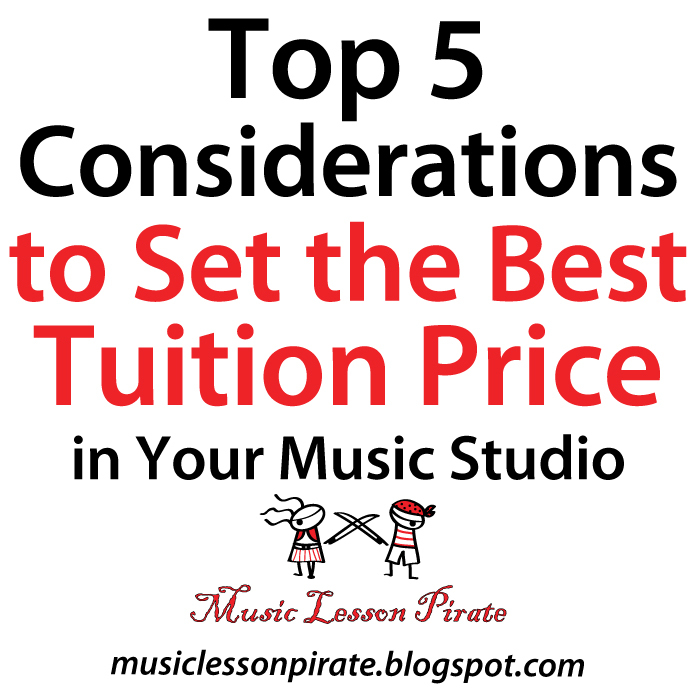 As you take these five points into consideration while setting your tuition prices in your music studio, I'm confident you'll be on the right track to both cover your own costs and make a profit, while being at an appropriate market rate. What other factors have you taken into consideration while setting your pricing? Please comment below to let us all know! I have a confession. I really love teaching adult students! I love all adult learners, but this post is specifically addressing beginning and intermediate adult students. It’s refreshing and motivating and exciting to me to see them grow and learn. Adult students are truly motivated to learn in a way different from kids. They have the advantage of maturity and perspective that come from having more years on this planet. I’ve found, though, that adult learners also encounter unique challenges, which kids do not. I’d like to take a minute (just sit right there), I'll tell you how we as teachers can help. Lack of time. Adults can be very busy. Most of those whom I’ve taught are working full time, or are college students, or both. Many have families of their own to take care of. Set realistic practice goals. Because I know it’s challenging to even get started at something that is either completely brand new, or has been neglected for a long time, my first thought when an adult approaches me asking for lessons is, “Yaaay!! Good for you!!!!! !” I automatically have so, so much respect for these people. So, I really want to help them be successful and to love it. With each student’s unique situation and schedule, I try to find a balance between high standards and attainable, realistic goals. I have to recognize that an adult student’s reachable, attainable goal for practice frequency may not be the same as a child student. And that’s okay. We take it week by week and adjust according to their needs and demands that week, and set a realistic goal for how many days they will practice that particular week. This may be different this week than it was last week, but it’s important for them to gain encouragement from seeing themselves reaching their goals. It is important to also try to set goals to make them stretch, of course, but just keep in mind that if it stretches them too far, they may get frustrated or stressed. So try to find that balance for each individual student, because the last thing we adults need is more stress. Be flexible with lesson frequency. I work with each student’s needs and goals individually to determine how frequently we meet. I’ve had adult students come weekly, biweekly, or monthly. In the case of less frequent lessons, make a plan to follow up with the student between lessons, such as writing an email or text, or making a quick phone call to make sure they are doing okay and see what questions they have. It’s essential for the student to still feel supported by you between lessons. I find the student is more likely to practice consistently all month long (and not just the days right before the lesson), if they know they will be held accountable more often and have me following up with them. Another option, which may suit some situations, would be to offer a lesson online in between the in-person lessons. There are many available video conferencing options, such as Skype or Google Hangout. I’ve recently learned of JamKazam, which is intended for groups of musicians to be able to rehearse remotely as if in the same room. I have yet to try it out, but if it solves the issues of sound delay and allows for the teacher and student to play together simultaneously, then this may be something of value for teaching as well. If any of you have already tried it out for teaching, please let me know of your experiences. Student gets frustrated, impatient, or is too hard on themselves. This often is a result of the student’s musical ear being developed beyond their actual technical playing ability. This can lead to the student having feelings of frustration, or even embarrassment about their sound (I’ll get to that second one later). Help them see/feel their own success. One of my main goals with adult students is to keep that spark for learning alive. Something motivated them and pushed them to change up their routine and budget and comfortable life and start violin lessons. I don’t want them to ever lose site of that. I really, really want to keep them motivated, and keep them excited, which comes from helping them see and feel their own success. When I was twenty-one, I started learning German. I had learned French and American Sign Language before, but this time was different. This time, I was going to do service abroad as a missionary for my church. I had 9 weeks to learn German. All of it. The entire language. One time, when I was feeling especially frustrated that I would never, ever learn German, my wise teacher explained to me the importance of taking a moment to not focus on what I hadn’t learned yet, but to see how far I had already come. In doing so, I realized that, yes, I had actually made tremendous progress. I had begun knowing absolutely no German, and after just a few short weeks (and a lot of hard work), I could carry on conversations and even understand native speakers. My point in relaying that story is that we need to help all our students to see how far they’ve already come, which can give encouragement in place of frustration. [“Hey, six months ago you weren’t even taking lessons, and now you’ve learned this many pieces!! And you’ve improved this and that (be specific).”] Help them to set small goals and help them recognize when they have met them. And celebrate the small victories with them!! Offer Rewards and Incentives. Rewards and incentives will definitely come in a different form than with young students. Why not encourage the adult student to set a goal that will make them stretch, and once they’ve reached it, they get to treat themselves to something special, whatever that may be. This can help keep them motivated and encouraged to see their progress. The student is embarrassed or self-conscious of playing in front of others. Give lots of opportunities to perform. A student can gain confidence by performing over and over in low-stress situations, such as a group performance class, at recitals, in rest homes or assisted living centers. The more they do it, the more comfortable and confident they will become, as long as you keep it positive and low-stress. Play duets with the teacher (or other advanced player). I always feel more confident when playing with someone else, which may be why I love chamber music so much. Playing with someone who is more advanced can build confidence, as the overall tone will be better, and the confidence of the teacher may rub off on the student. Perform for kids. This one may sound strange, but it stems from my experience learning foreign languages. I found that the most patient and nonjudgmental teachers were, in fact, children. They would tell me straight up that I was saying something wrong and had no problem correcting me, but they did so with complete sincerity and caring. Although they were blunt, it was never in a way that made me feel self-conscious. Anyway, I think performing for children can be a great chance to learn and improve confidence in a friendly environment where it’s safe to make mistakes. So, these are just a few ideas to help adult students be successful. What other challenges have you seen adult students face? And what have you been able to do to help them? Copyright 2012-2015 Megan Watson. Awesome Inc. theme. Powered by Blogger.